Over the years, we've gotten questions from people just like you with Disc Jockey questions about their event. Below, you'll find the most popular ones. If you have a question that's not answered here, please email it to scott@ofms.us . We'll quickly send you a response. No. Our DJ staff will perform continuously throughout the night. From our scheduled start time until your party is over, the music will be playing (unless of course you request a break for some other reason). Our services are based solely upon what you want them to be. We have learned that keeping your crowd alive depends on a lot of things including the type of music, type of mix, DJ personality, atmosphere, etc...but not just the music. Taking the time to submit lists online will greatly increase your chances of a successful event and also allow your DJ to customize the music at your event. Yes. This may be just as important to you and your event. You may also create a do not play list and send it to us via email. Q: Can I provide you a list of songs on Spotify? Yes, If you have a Spotify account, you can provide us a link to your playlist for review. Our music collection spans thousands of songs from several decades. Often a client will want a song that is somewhat obscure and we may not have it. If this is the case there are two options: you may either supply us with the CD before the event so that we may check it for scratches, or (if you do not own a legal copy) we will obtain that song before your event. Just give us lots of advance notice if we need to find a song. If you give us a CD we will return it to you at the end of the night. One of the greatest concerns of bands and DJs is that the music is too loud. This will not be the case with our services. During your cocktail and dinner hours we will play soft and relaxing background music. The sound will be as evenly dispersed throughout the hall as possible. We will make sure that your guests can hear both themselves talking and the background music. When it comes time for dance music we will adjust accordingly. Speakers may be repositioned. Our staff will adjust the equalization of the music in order to get the right sound for the specific room. We will focus the music in the dance floor area. This means that while the volume is loud enough to dance to on the floor, the rest of the room will be able to continue to hear themselves socialize. Our DJs will have a small amount of equipment on-hand to ensure the music keeps going. Our equipment and staff are very dependable. If something does fail, it can be easily fixed or switched without you and your guests even knowing. If something major happens (which it never has) an off duty employee may be called upon to provide additional reinforcement. Yes, our light show is included in the price of the package. Q: Will my DJ be drinking at my event? Besides it not only being against state law, our company does not allow any of our entertainers to consume alcohol before or during any event. We are strict on this policy and you have nothing to worry about. We are professionals and act accordingly. Most quality banquet facilities require entertainment companies to be fully insured. We are covered by a aggregate liability insurance policy. You and your guests are protected by our service. This gives you the security of knowing that you, your friends, your family and the facility are taken care of by a professional company that cares enough to be prepared. While it is common to tip the entertainment industry, it is not mandatory. Our staff is well paid from your fees. However, if your DJ surpasses your expectations and you wish to tip, it would be considered extremely generous and taken as a great compliment. This is another common question. The answer is yes. 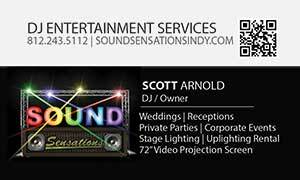 Our DJs are often at your location for 8 hours or more after setup and takedown time is included.